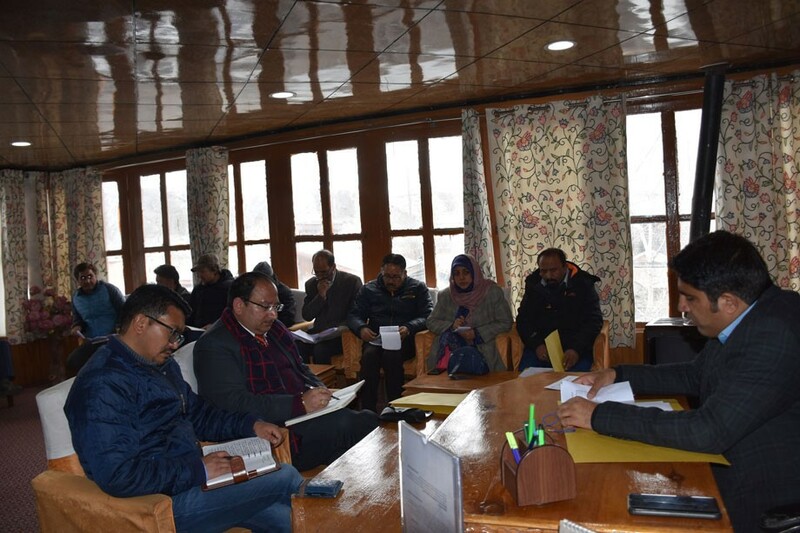 To review the status of Assured Minimum Facilities (AMF) across the designated polling stations in the district for smooth conduct of General Elections, 2019, a meeting was convened by District Election Officer (DEO), Kargil Baseer-ul-Haq Choudhary with the concerned officers on March 30 at DC Office. DC discussed in detail the work underway by the district administration for ensuring the provision for Assured Minimum Facilities (AMFs) at the polling stations in the district. The meeting was informed that the process for creating the facilities at all the designated polling stations is in full swing as per the set guidelines. DC was informed that provision of water has been made at 39 polling stations, while other works are in progress. As regards to the provision of electricity, the meeting was informed that 46 polling stations have been provided with electricity while as the process of electrification in case of other polling stations is currently underway and is expected to be completed soon. DC while inquiring from the officers about the status of the provision of solar lighting at 124 polling stations directed the officers to ensure the installation of this system well in time. It was further informed that provision of water facilities has already been ensured at 39 schools and work is in progress at the remaining locations while as the process for the provision of ramps is currently underway at 102 polling stations in the district. He directed the concerned executing agencies to further speed up the process and ensure the completion of all the remaining works well in time to ensure smooth conduct of General Elections and fixed April 15 as the deadline to complete the whole process. DC asked the concerned officers to work in tandem and close coordination and submit the status report of the progress achieved on a daily basis.